I mentioned recently that the long (loooong) awaited new Tamora Pierce book was finally out. I got it from my library, and then (because life is busy) spent a couple weeks reading it. 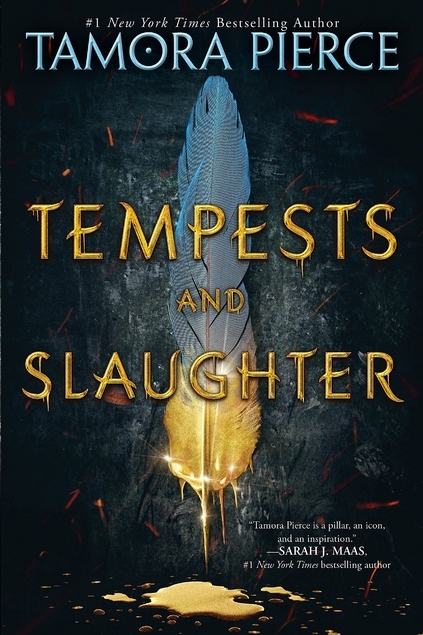 So how did Tempests and Slaughter, Book One of the Numair Chronicles, turn out after all this time? Well…I should say that very few things could live up to the amount of build-up that came before this book. It reminds me of the third season of Sherlock. The answer to the worst cliffhanger I’ve ever seen had so much pressure behind it, I had little hope that the pay-off would actually work. The fact that it did was, in a meta kind of way, as satisfying as the actual answer. But I mention this because of its rarity…and this is all a big, long, almost apologetic and avoidant lead-in to saying that, after all these years of waiting, Tempests and Slaughter was, well…okay. Not a bad book! But only okay. The tale focuses on young Arram Draper, who will someday grow up to be the Numair we know from earlier (but chronologically later) Tortall books. (Some spoilers to follow, but only if you haven’t read the Daine books.) Arram is a student mage at the great Carthaki University. He is troubled by the gladiatorial games held in Carthak, and by the acceptance of slavery within the empire, but he loves his classes and excels at them. He becomes friends with Ozorne, a minor prince of the realm, and Varice, a lively, beautiful girl Arram harbors a crush on. I’m not sure where to stop this summary, so I guess I’ll just stop here. The dilemma points to what is in fact the weak point of the story–there’s not much story. The premise is lovely, but there’s little plot, no driving direction to the book, no strong climax to pull threads together. It’s somewhat like a Harry Potter book without Voldemort. After all these years of waiting, this book felt more like a set-up to (the promised) book two, when presumably some hinted conflicts will finally come to the forefront. Arram is a likable character, honorable and genuinely excited by his studies. I did like reading about a magic-learning character who wants to learn. So often the trope is for the main character to be largely disengaged from learning (creating opportunities for incidents through mishaps and school stress), perhaps with a friend (hi, Hermione!) who is more scholarly. Arram has his share of mishaps, usually because his magic is too strong, and I liked his earnest desire to learn. Varice is fun too, a different kind of heroine from Pierce’s usual heroines. They tend to be scrappy, tough and warriors in a physical sense (though in touch with a more traditionally feminine side too–even Alanna likes dressing up and looking beautiful sometimes too). Varice is more traditionally feminine, loving cooking and pretty clothes. I don’t think we ever see her hold a weapon. But she is also a very powerful mage, and much is made of how her kind of magic shouldn’t be dismissed as somehow lesser. She can have dramatic impact through her cooking and her charm–which, to give it a more dignified name, is really a masterful form of diplomacy. Pierce has always had compelling male characters, but nearly always a female lead, so with a male lead it was nice to still see a good female character in the mix. Ozorne was intriguing as well, especially towards the end of the book. The Daine books (more properly called The Immortals Quartet) tells us that things went very, very badly for Arram/Numair and Ozorne in the end, and we meet Ozorne as a vicious and ruthless emperor. There are only very slight hints of that here. This Ozorne is a loyal friend and dedicated student, with a few sore points, a bad temper and questionable ambitions…but not a lot of the negatives that must be coming. I’m not sure how I feel about that–Ozorne has to have good points or why would Arram have been his friend to begin with…but this contributes heavily to the feeling that this book is mostly a set-up, for more intense conflict in the second one. I liked returning to Pierce’s world after all this time, even if we’re in a slightly different place. The Graveyard Hag was a delight in her small appearances, and I liked some of the further insights we were given into Carthaki culture, and the cultures of the broader region. It was nice just to see Pierce’s style of magic again. I did like reading this one, and there are certainly good things in it, characters chief among them. But did this live up to my hopes? Not really. And I feel SO uncomfortable saying that! Tamora Pierce was THE author of my adolescence (Gordon Korman before her, L. M. Montgomery after her), and her portrayal of powerful heroines who were absolutely equal to any man was pivotal in my life. So I feel quite guilty labeling a book from an author I so respect as merely okay. But that was my experience. I suspect reading it slowly may have contributed to my sense of it ambling along. And I also suspect, a little sadly, that I would have loved this book better some four years ago. I can’t quite put my finger on what about me has changed, but I think my tastes, my interests, and my expectations around books might have been better aligned to this one a few years ago. Nevertheless! If you are a Tamora Pierce fan, this is certainly worth the read. If you are not, find yourself a copy of The Song of the Lioness quartet at once, and come back to think about this one later on. And I, meanwhile, will look forward with more expectations to the second book in the series, which hopefully will give me the part of Numair/Arram’s life I’m really looking for, after the set-up and into the heart of things! Started reading The Song of the Lioness earlier this year and have read two books so far. Don’t know why it’s took me so long, given all of your amazing recommendations. I am really enjoying them! I agree that this book’s purpose was setting up the plot for the next one…which hopefully won’t be as long in coming as this one has been. You could say this book was episodic, since there wasn’t a major climax anywhere. It was good, but I can’t say that it was amazing, which was kind of devastating to me. I’ve been in love with Tamora Pierce’s Tortall Universe since 7th or 8th grade. What I did really like was getting more of the history of a lot of the characters that appear in the Immortals Quartet. Like Lindhall. It was nice to see him again and learn more about him. And Tristan, before he became a tree. Varice was fun. We didn’t get much of her in Emperor Mage and it was very nice to learn more about her. I have a better opinion of her now. Fingers are crossed that this book was the prelude to something epic. Sometimes it’s just too much for a long-awaited book or film to manage to live up to the anticipation it engenders. The element of surprise when there’s no expectation is certainly easier on the author or filmmaker.